These five cats , are all similar in size to our other cat patterns. We created it for people who don't want a large project. The pattern also includes a fish, a barn swallow, and a butterfly. Cats need something to play with. Gold lamé fabric for the eyes and a fish is included with the pattern. 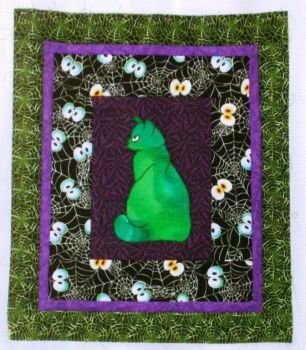 Julie Griffiths made herself a Halloween quilt.